Getting older is inevitable. But what happens as you age can depend on a number of factors. These factors include family medical history, physical activity, and the types of food choices you make. 1. We are what we eat. Saturated fats can lead to heart disease and also problems with memory and concentration. A diet rich in vegetables, lean proteins, and healthy fats (like those found in nuts and olive oil) can keep you healthier and more energetic. Foods rich in omega-3 fatty acids such as tuna and salmon can reduce inflammation, which can help battle painful conditions like arthritis. 2. 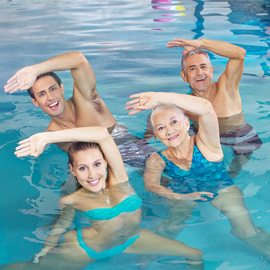 Regular physical activity keeps us young. The more active you are, the better your chances of staying fit and limber. Incorporate flexibility and balance exercises, as well. These reduce your chances of falls, which become increasingly dangerous as we age. Many people consider memory loss and poor concentration just part of old age. But when we learn new activities, we make healthy aging more likely. Try traveling a different route home from work every day, learning a new instrument, or even studying a foreign language. When we spend time with friends, family, and even our favorite pets, it has a positive effect on our health. Studies show that people with active social lives have lower heart disease risk; they also tend to have sharper thinking and a reduced risk of memory problems as they age. Sunscreen is the beauty product that is most likely to give you younger and suppler skin. Over time, the Los Angeles sun can break down collagen, leading to sagging and wrinkles. A recent study showed that even people in middle age could benefit by wearing sunscreen. Put it on daily and avoid the outdoors during peak sunlight hours. Want to achieve a healthier, more energetic you? Talk to Dr. Payam Kerendian at the Delight Medical Center, with offices convenient to Los Angeles and Bakersfield, CA.